My kids. They are big. It’s hard to remember that they aren’t so little when we’re at home, all in our regular routines. There’s playing, and bickering and whining. But then Eddie says something so completely obnoxious, I am reminded that at nearly nine, he is dangerously close to that pre-teen territory. Or when he chooses to watch sports instead of whatever is on Disney after school. Or the fact that even though he prefers a kiss an hug (and a quick twirl of my hair, a habit from when I nursed him) and for me to tuck him in, he is perfectly capable of putting himself to bed at night. It’s not as noticeable with Cait, though at 7 with some older family friends as role models she is ever the fashionista and drama queen. She feeds off of drama in a way that really makes me scared for the teen years. She is quick to shout that nobody likes her or that she never gets what she wants. And yet, she is the most thoughtful and sensitive of all the kids. Whereas Eddie and Hannah got up yesterday morning and demanded breakfast, Cait snuggled up to me, wished me a happy birthday, and asked me what I wanted. And then there is Hannah, who admittedly, I have a tendency to baby. She is my (current, anyway) baby. She is the most ornery soul I have ever met, difficult for the sake of being difficult, and the reason we were pretty sure we were done having children. She hates to sleep, hates to eat, hates to be told anything. She’s a scrapper and loves a good fight. But the other side of her personality is so dynamic. She is very matter of fact, she can hold her own in a conversation with any adult (when she was 2, her daycare teacher told us that she was bored when Hannah wasn’t around because having her there was like having another grownup to talk to. ), she predicts the future and is usually and very creepily right. She has an amazing imagination and can entertain herself with her doll house or little people for hours. HOURS. What is the old nursery rhyme? When she’s good, she is very very good, but when she’s bad, she’s horrid. Anyway–my point is that none of these kids are babies anymore, which is a good thing considering that we will have 2 actual babies in the house in, oh, 4 to 5 months. It’s hard for me to accept though. This picture of Hannah from the weekend is what set me off. 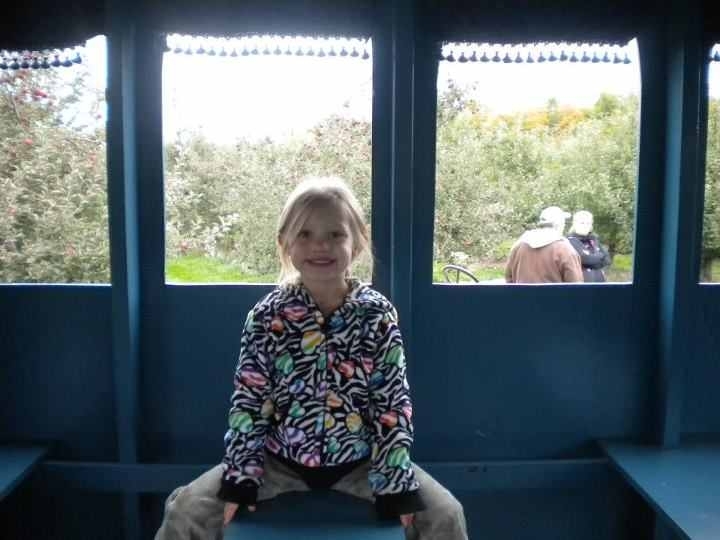 I was all bent out of shape about her sitting alone on the train ride in the apple orchard. Convinced that the train would jerk and she would fall, or that she would launch herself out the window just as we were crossing the pond. And then I saw this. She is most definitely not a baby. She’s a kid! This all leads me to the subject of child spacing. Before I had kids, and even when I just had one, I had it all figured out. I would have 2 close together, and once they were old enough to be in school, I’d have 2 more, also close together. Each would have an instant playmate, we’d not have insane childcare bills, and it would just be perfect. Eddie and Caitlyn being 19 months apart, to me, was the best thing ever. Eddie was still little enough that he didn’t feel too disrupted to have a baby in the house. Cait was just so chill that it didn’t matter if I had to ignore her for a few to deal with a tantruming Eddie. They were instant playmates, and while they have a tendency to be at each others throats these days, they were and still are the best of friends. Hannah came a bit sooner than we’d planned–Caitlyn turned 3 just after she was born. I’d have waited a bit longer if I’m being honest, but having a ages 4, 3 and a newborn was ok. There was definitely jealousy from Cait when Hannah was little, and there still can be today. What I’m realizing though is that 3 years apart, is the perfect amount of time between sisters. Cait shares her makeup and dresses Hannah up. They enjoy playing together, especially when Eddie is involved in boy stuff. They fight like sisters too though with hair pulling, scratching and many tears. I never had a sister, so this is an interesting dynamic for me to watch. Soon we will add our final babies in to the mix. Hannah will be close to 5 when they arrive and it’s so much like starting over. I worry about how the one who has been babied will transition to being the middle child. I worry about the big kids feeling like they will have even less of my attention. I worry about a lot of things actually. The spacing seems right though. I never thought I would have 5 kids. In fact, for all of my planning, I was sure I was done with 3. But adding 2 more now seems right. It will be tough at the beginning for sure, especially as the older 3 will be right in the middle of spring activities with summer on the horizon. Age wise though, I don’t think we could be in a better spot. Obviously nothing has worked out the way I planned, but somehow I think it’s all working out just right. it will. it’s funny you say that because J was later than I’d have picked, but 2 years I think is perfect! If he had been 3 years I’d probably say the same thing. J is so much like Hannah it makes me smile to read your description of her. We’d planned roughly 2-3 years between each child—and then Paul lost his job after the second child, so we waited more than 4 years. And yet…it was just right! This makes me happy. Also it is kind of working out like you planned with two groups of kids close to each other but further from the others, except that one group has three kids instead of two. I think it’s great. Ahhhhh. It’s so tricky. I would’ve liked 5 years between the first and second (get one in kindergarten…), but T and I are old as snot so we kept on trucking. And like you with Hannah, I sometimes still see Ezra as a baby/toddler. He’s 4.5. I can barely carry him. He’s not a baby. Sigh.